Liam Killeen (Specialised Racing) and Beth Crumpton (North West MTB) were the winners in the elite races at the final round of the National Cross-Country MTB Series at Cannock Chase on Sunday. 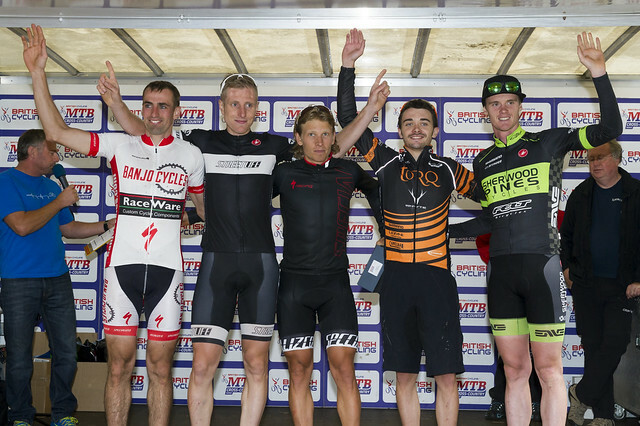 Crumpton also secured the overall Series win, while in the elite men’s category Phil Pearce (Banjo Cycles) took the win. Jason Boutell (Velovelocity/Risbygate), who was the only rider able to stay with Killeen, took second, and Alex Welburn (TORQ Performance) took a fine third place to secure his best performance of the year in the Series. With the Series title on offer it was all to play for for both Pearce and Dave Fletcher (Pines Cycles). Either rider had the opportunity to take the title, although it would take a total disaster by Pearce and a high finish from Fletcher as the odds were stacked in favour of Pearce who moved up to Elite from expert at the end of the 2014 season. Series leader Pearce took off from a fast start to lead the race out of the arena, Fletcher sitting in fifth place but still in contact with Pearce as the race headed out into forest. Some 19 minutes later it was a select group of Boutell, Pearce, Fletcher and Killeen who would appear first, already a useful gap back to the chase group of Ian Field (Hargroves-Ridley), Welburn and Gareth McKee (Banbridge CC). Barring any incident it looked as though the win would come from the lead group and as the race worked its way through the forest tracks, Killeen and Boutell made their move. They gained some eight seconds over Pearce who in turn had a slight lead over Fletcher. Welburn was pushing Fletcher while Field looked content sitting in sixth. Lap three proved to be the turning point of the race. Killeen started to wind up the pace, while Boutell was unable to match the former British Champion for speed and was some 25 seconds down but had enough of a gap over a chasing Pearce, Fletcher and Welburn who were locked together in fourth and fifth. The status quo remained the same for the following lap, but as he started the final lap Killeen had increased the lead gap to some 50 seconds over Boutell. Meanwhile, Welburn had worked over Fletcher and had moved across to Pearce. Pearce knew he had the series in the bag but was still going for the win, but Killeen was unstoppable and took another career win just shy of 90 seconds over Boutell. Welburn came into the arena alone to take third while Pearce finished fourth, one minute ahead of Fletcher to take the Series win. “I’m really over the moon with that,” said Series winner Pearce. “It’s just unbelievable. “I had a plan to win the race today, it’s what racing is all about after all, but the important thing was to stay out of trouble and to keep the bike rolling and just get to the finish line in one piece. “Today was important to me to finish such a great year, after winning the experts in 2014 then straight to win the Elite series. When I came into the Elites this year I really didn’t think I would be a top contender, it was a year to find my bearing then maybe go hard next year but finishing sixteenth in round one. 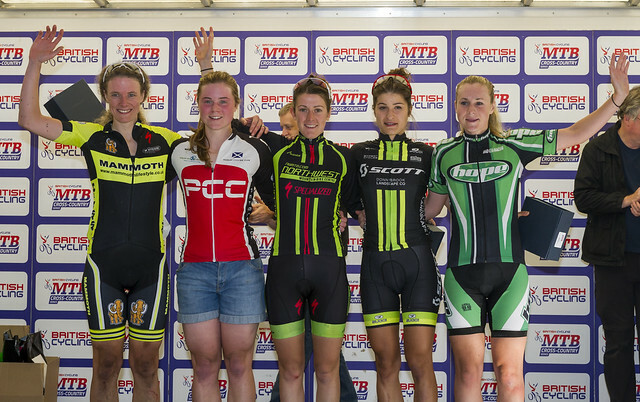 Beth Crumpton (North West MTB RT) made it a Cannock double to take the race win and the Series title after a dominating ride on the Tackeroo course. With Annie Last and Alice Barnes away on International duty with their respective teams, the Cannock line up made for an interesting race. Series leader Kerry MacPhee saw her season fall apart before the end of the first lap having to retire from the race, but Crumpton held off a strong challenge from Peeble CC’s Lucy Grant and the Polish U23 Champion Marlena Drozdziok. A powerful start by Crumpton had the race strung out before they left the arena, while Grant was sitting in second with Drozdziok in close contact. They were headed up by Annie Simpson (Team Hope) and Nicky Healy (Mammoth Lifestyle) and the rest of the field. The race went into the forest for some 20 minutes and re-entering the small wooded area before the arena it was Crumpton who had already forged ahead by 20 seconds, Grant and Drozdziok locked together in second while Simpson and Healy were a few seconds back. The TORQ duo of Jules Toon and Jo Clay were having to fight it out for fifth but the shock of the opening lap was Kerry MacPhee who didn’t look as though she was having an easy time in the race, the Rock & Road rider retiring as the race worked towards the end of the opening lap. Crumpton increased her lead over the next lap to just shy of a minute to the Polish girl who had got the better of Grant who, looking as though she was struggling and with Healy changing across in fourth, the Peebles rider looked as though her strong start would be to no avail. But she recovered to hold third spot as the race progressed. Annie Simpson, although dropping back to fifth looked safe with Toon and Clay unable to make inroads. Crumpton was away and alone for the remainder of the race, no one able to make any kind of dent on her lead. Grant found her second wind to hold off Drozdziok and regain second place while the rest of the race time-trialled in across the line. “I felt really strong today so the plan was to go out, get a gap and show people what I could do,” said Crumpton, before the results were announced. “I know I can win bike races and I showed today I can do that. It has been good preparation for next week’s trip the Italy for the last World Cup race of the season. “I started today in fifth place overall but I’m not celebrating until the podium because I really don’t know if the win was enough to get the overall, I’m waiting for the numbers to be worked out, if I have I’ll be so chuffed. “I heard Kerry [MacPhee] had to retire but I don’t know if or why she had but if that’s the case then maybe I have got it. I’ll be surprised, I really didn’t think I was in contention for the overall but the season has come good. 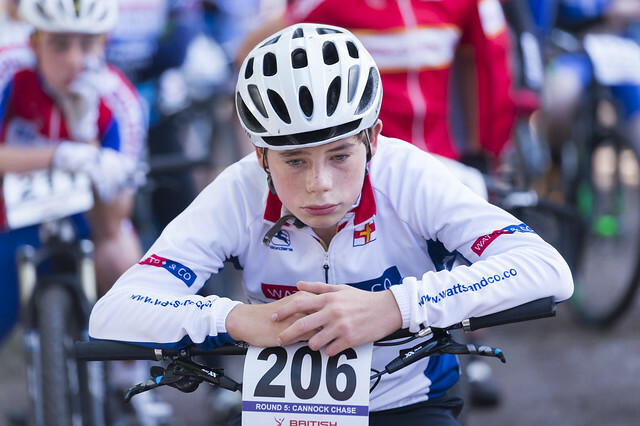 Cameron Orr (Team Velocity) took victory in the youth race after a race-long battle with Harry Yates (Hargroves-Ridley) and Olli Dawson (Border City). With Dan Tullet on International duty and Ross Harnden injured, the racing proved to be a more open event for the big field with the three leaders fighting for position throughout the three laps, Orr managing to escape from Yates on the final lap to take the victory. Sophie Wright (Strada-Sport) took a relatively easy win in the youth girls race. The National Champion didn’t put a foot wrong from the gun to ensure a clean sweep in the Series. The race for second proved to be more interesting between Kim Baptista (Nutcracker) and Patsy Caines (Certini), Baptista holding off the challenge by a handful of seconds. Harry Birchall took the win in the juvenile boys race, the Certini rider rode a strong race to hold off Charlie Craig (Scott Racing) and Charlie Aldridge (Stirling BC) to ensure second overall in the Series. Ben Tulett (Beeline Bikes) although finishing fourth lifted the series trophy. Harriet Harnden (Malvern Cycle sport) wrapped up the Series with a win in the juvenile girls race, the National Champion was too strong for Maddie Wadsworth (Beeline) and Peebles CC’s Anna Mcgorum who finished second and third respectively. Paddy Atkinson (Bikesoup) got the better of Jacob Phelps (Muddybumbikes) and Clee Cycles’ Arthur Green to take the win in the junior race. Again, with series winner Frazer Clacherty and Tom Craig riding abroad, the racing proved to be more open with the result coming from the final lap. Martha Gill took her first win in the Series to take the top step of the podium in the junior women race holding off Australian Megan Williams (Kenmore CC) and Charlotte Broughton (Corley Cycles-Drops). David Creber (Wentbridge Foods CC) took the win in the expert race and secured the Series title in almost a solo ride from the gun. Will Taylor (Southdown-Casco) took second while Rhys Hidrio (Caesarean CC) took the final step of the podium. Kirsty MacPhee (Rock & Road) took the race victory and secured third overall in the expert female race to round off her first season on the dirt, beating Series winner Helen Wainwright (Ride DMC) into second after a hard three laps. Sarah Murray took third. In the Veterans race it was Marc Chamberlin (WDMBC/Specialized) who took the win from Paul Hopkins (Merida FR) and Sam Humphrey. The National Champion rounding off a successful campaign with the Series title. Gould (www.zepnat.com RT) completing the podium. Vic Barnett (Wellend Valley CC) took the win in the super veterans race from Tony Wilkins (Wolsey RC) and Denis Smith. Series winner Andy Roberts, although not competing through injury, received the Series title taking four best wins from five. Bolsover’s Maddie Smith took the win in the veteran women’s race after another race long battle with Alison Holmes (Run & Ride) to secure the Series title. National Champion Sarah Barnwell (Clwb Beicio Mynydd Dyffryn) took the win in the Grand Veterans race, Elizabeth Clayton (Lichfield CC) was second while Janet Burthem (Velo Club Melyd) completed the podium.